If you live in an area with mild winters, you can still grow attractive, red-skinned nectarines if you pick the right cultivar. Consider growing Panamint nectarines, a delicious fruit with a fairly low chill requirement. Panamint nectarine trees are very adaptable for home gardens and produce fruit with an excellent flavor. For more information about Panamint nectarine fruit, plus tips on caring for Panamint nectarines, read on. If you aren’t familiar with Panamint nectarine fruit, they are large, freestone fruit and quite attractive. The skin is a bright red white the flesh is yellow and juicy. Panamint nectarine fruit has been a favorite for some time in Socal, where the winters don’t provide enough cold weather to grow other varieties. The fruit only needs some 250 chill days, meaning days where the temperatures dip below 45 degrees Fahrenheit (7 C.). You can successfully plant Panamint nectarine trees in your home orchard in warmer areas. These trees thrive in U.S. Department of Agriculture plant hardiness zones 8 through 10. When you start growing Panamint nectarine trees, be sure to put each tree in a site with adequate room. The standard trees grow to 30 feet (9 m.) tall and wide. Space Panamint nectarine trees some 30 feet (9 m.) apart to allow for this mature development. It will make caring for Panamint nectarine trees easier, since you can pass between the trees to spray, prune and harvest. If you plan to prune the trees and keep them smaller, you can plant them closer together. Panamint nectarine trees begin to bear heavy crops at just three years of age. However, you won’t see them at peak productivity until they are about a decade old. When you are caring for Panamint nectarine trees, you’ll need to be sure the trees are planted in a sunny location. They require soil with excellent drainage and regular irrigation is a must, starting at planting time. After maturity, water once a week in early spring and increase the frequency as temperatures rise in summer. Decrease watering in fall and stop altogether in winter. Caring for Panamint nectarine trees also requires feeding them. 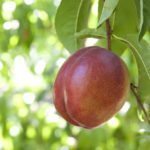 Fertilize your nectarine tree with organic fruit tree fertilizer, using low nitrogen mixtures with higher phosphorus and potassium in winter, but higher nitrogen fertilizers in spring. Pruning nectarines is important too. You can keep the trees healthy and productive if you prune them regularly and heavily. This also helps maintain the size you want.